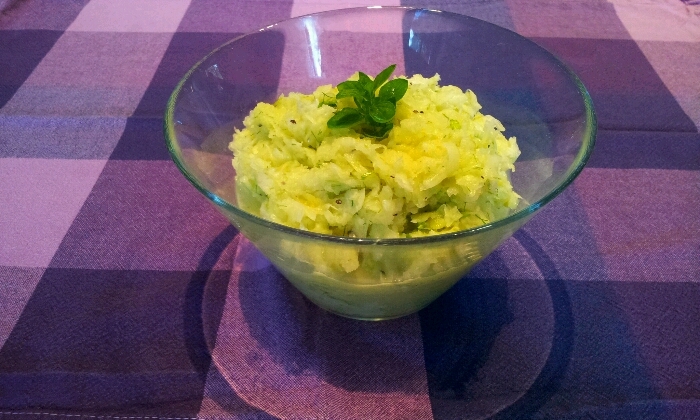 A Normandy Kitchen: Grated fennel slaw. Grated fennel slaw is what I make in a dash. As I love fennel salad, which has to be cut razor thin to be good, but that can take a long time to cut on a mandolin or by hand. This has still the taste even though something quite different. I use a hand grater, one of those micro planes with a larger slicer blades. (optional extra a tablespoon of pastis for fun! So grate the side stalks first, then work your way down by cutting across wards. Even incorporating the root part, as it's all good. The deep green fronds (that grow at the top), cut them by hand. They look, but don't taste like dill, they add flavour as well as colour. Peel the apple and grate to the core. Add the lemon first and coat it all to stop it discolouring then the oil and the salt. Either eat straight away or put into the fridge turning the slaw a few times. After about an hour, there is a water residue (from the salt) that you can discard, but add a splash of oil and mix again. You could at this point add mayonnaise and/or the pastis. Try it without the mayonnaise the first time you make it as it is more refreshing (I like it more without).